Sometimes you need a little more than a basic mountaineering axe. The Cassin X-Light is a transformer axe that lets you customize your tool for the route. If you’re not sure of the anchor situation and might need to pound a piton, the hammer head is perfect. If you might encounter some blue ice, swapping the handle for an X-Dry grip turns it into a serious ice tool. Designed for light and fast technical ascents, the axe is a little extra insurance on dicey skimo routes like those found on the Grand Teton. 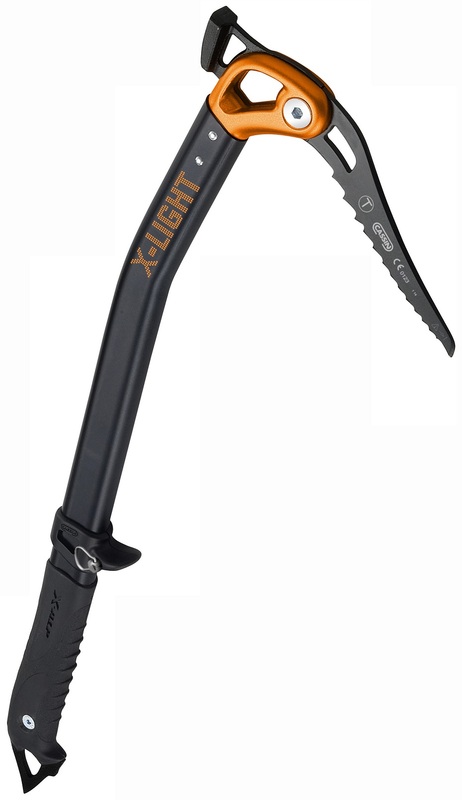 The X-Light is possibly the only good hybrid of a standard mountaineering axe and full-on ice tool. Mildly curved shaft can be used as a cane or to climb mild technical ice. Three different head configurations (adze, hammer, pick only) let you adapt to the route. Included X-Alp grip has a soft hand for good grip when used as a basic pick. Optional X-Dry grip adds a little more hand clearance for steeper technical ice. T-rated chromoly steel pick is strong enough for piercing ice and self-arrest. 7075 aluminum shaft is super light while also being T-Rated as CE-UIAA type 2. Carabiner holes at the head and spike accommodate any leashes or lanyards. Included X-Trigger pommel can be adjusted without tools so you can switch to/from plunging. Stainless steel adze and hammer securely plug into a hot-forged aluminum head. Pick does not have teeth near the shaft to avoid glove damage when used as a cane. Steel spike is easily replaceable so you can use the axe for years to come. This is a great axe for general skimo use. The hammer handles pitons without issue and the straighter, longer shaft makes plunging as a cane much better than any technical tool out there. The moveable finger rest is sweet, as well, allowing you to slide it up the shaft when plunging or daggering. It also climbs steep ice quite well.